Now we can share the release date for the critically acclaimed The Walking Dead: The Telltale Series - A New Frontier on a special season pass disc at retail, and announce the release window for the upcoming Episode 3: 'Above the Law'. 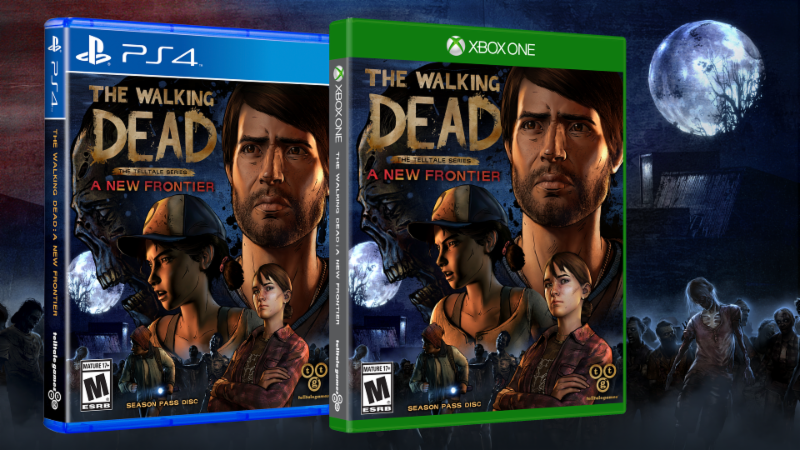 Beginning February 28th at North American retailers, and March 3rd at European retailers, The Walking Dead: The Telltale Series - A New Frontier will be available for purchase on a special Season Pass Disc for PlayStation 4 and Xbox One consoles. The season pass disc includes the critically acclaimed two-part premiere episodes, and grants access to all subsequent episodes in the five episode season for download as they become available. 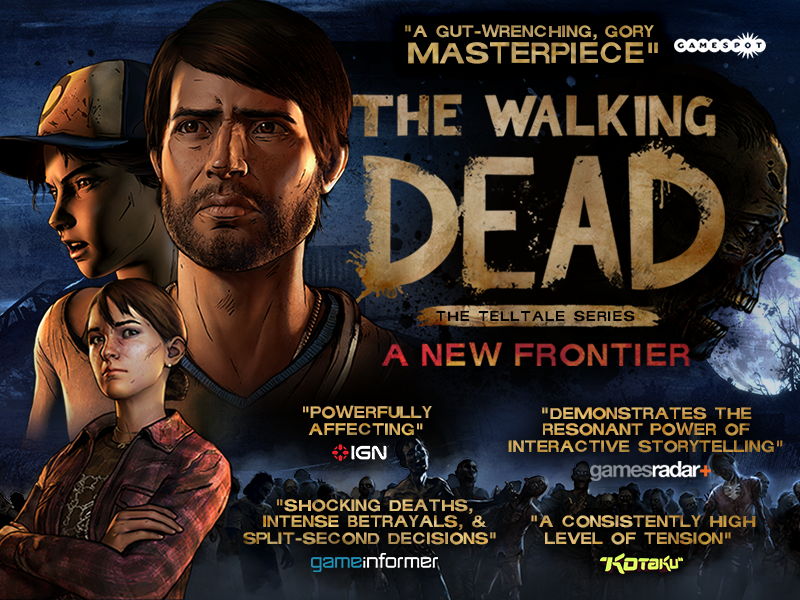 The two-part premiere of The Walking Dead: The Telltale Series - A New Frontier launched to widespread critical acclaim. In their review of the premiere, IGN.com said that, "Smart characterization and writing for Javi and his family, plus the return of Clementine, add weight to a largely unfamiliar but already engaging new frontier that I can't wait to continue to explore," adding that its "uncharted territory feels familiar and, excitingly, fresh." GamesRadar said that A New Frontier, "demonstrates the resonant power of interactive storytelling," and that it, "finds the right balance between rewarding longtime players who've shaped their own version of the story and welcoming those who might be hopping aboard this grim adventure for the first time." Game Informer said the two-part premiere has, "shocking deaths, intense betrayals, and split-second decisions to second-guess," claiming that "Everything leads up to a hell of a cliffhanger, making me intrigued to see what happens next." In further news, we can also confirm that the much-anticipated Episode 3: 'Above the Law' is set to debut later next month. Look for more details on the episode in the coming weeks. When family is all you have left... how far will you go to protect it? Years after society was ripped apart by undead hands, pockets of civilization emerge from the chaos. But at what cost? Can the living be trusted on this new frontier? As Javier, a young man determined to protect his family, you meet a young girl who has experienced her own unimaginable loss. Her name is Clementine, and your fates are bound together in a story where every choice you make could be your last. 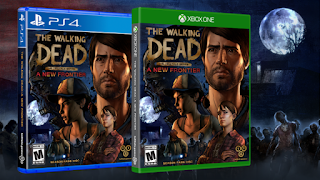 The Walking Dead: The Telltale Series - A New Frontier Episode One: 'Ties That Bind' Part I is rated 'M' (Mature) for Blood and Gore, Intense Violence, Strong Language, and Use of Drugs by the ESRB. Episode Two: 'Ties That Bind' Part II is rated 'M' (Mature) for Violence, Blood and Gore, Drug Reference, and Strong Language by the ESRB. 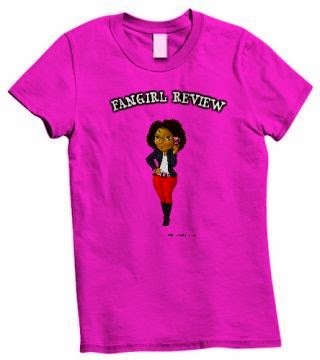 Future content in the season is yet to be rated. To date, The Walking Dead: A Telltale Games Series has sold more than 50 million episodes worldwide, earning more than 100 Game of the Year awards from outlets including Metacritic, USA Today, Wired, Spike TV VGAs, Yahoo!, The Telegraph, Mashable, Polygon, Destructoid and GamesRadar, and was also the recipient of two BAFTA Video Games Awards for Best Story and Best Mobile Game.